In this edition of Muscle Car Milestones, we’ll look back at the 2012-2013 Ford Mustang Boss 302. Ford created the original Boss 302 as a Trans Am racing champion and as a formidable opponent to the Chevrolet Camaro Z28. The 2012-2013 Mustang Boss 302 features heritage-inspired styling cues along with slick graphics and outrageous color schemes. And with an arsenal of performance equipment, the new Boss 302 packs plenty of firepower with the right amount of in-your-face attitude to back it up. Let’s take a look and see if this newest version of the Boss 302 is as good as the original. 43 years ago, the 1969 Boss 302 was the brainchild of legendary car designer Larry Shinoda. Shinoda called this unique Mustang the Boss 302 as homage to his boss Simon “Bunkie” Knudson. The Boss 302 was also conceived as a Trans Am champion, aimed at the International Sedan Racing Class and the formula-oriented sportsman driver. 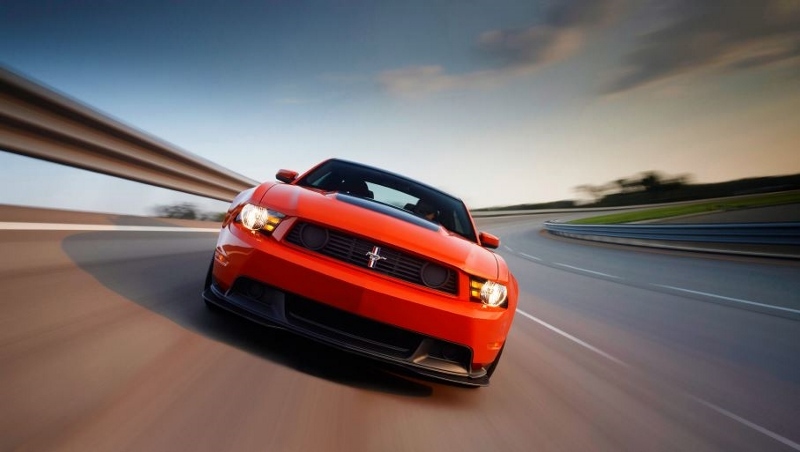 The 2012 Ford Mustang Boss 302 continues that legacy as a street legal racer that’s also equally at home on the track. The heart of the Boss 302 is an all-aluminum 5.0-liter DOHC V8. This powerplant is exclusive to the Boss 302 and features twin independent variable camshaft timing, “runners-in-the-box” intake plenum, and aggressive engine control calibration. It’s naturally aspirated and generates 444 horsepower and 380 lb-ft of torque. No elaborate gizmos or any fancy supercharger were needed to squeeze this much horsepower out of the engine. Tweaks to the engine like a revised camshaft with a more aggressive grind and stronger alloy cylinder heads help give the Boss a little extra muscle under the hood. Car and Driver put the Boss 302 to the test and came up with some pretty impressive numbers. It only took 4.3 seconds to go from 0 to 60 and the Boss sprinted the quarter mile in 12.8 seconds running 113 mph. Those numbers are just a tad shy of the Chevrolet Camaro ZL1 but where the Boss 302 really shines is on the track. Speaking of track, the Boss 302 comes with a clever set of keys that allow it to fully realize its abilities out on the track. The black key is great for the daily commute and cruising around town but insert the red TracKey and the Boss 302’s track capabilities are unleashed. TracKey adds a second set of powertrain control module software to the Boss 302 for track usage. With TracKey, the TracMode software alters more than 200 engine management parameters and provides full race calibration and two-stage launch control. The launch control functionality is similar to that used on the Cobra Jet race car. By using a combination of steering wheel buttons, the driver can set the tachometer needle to a desired launch rpm. The driver then floors the accelerator and the engine will rev to the preset rpm until the clutch is released. This helps aid acceleration and gives the driver better control from a standing start. Performance is also improved by removing the restrictor plates in each side pipe. Ford also created a limited production Laguna Seca version of the Boss 302. The Laguna Seca takes what’s already great about the Boss 302 and comes with augmentations that further improve its track abilities. One area Ford’s engineering team concentrated was on chassis enhancements. The Laguna Seca has increased body stiffness and a firmer chassis setup that help it shave off precious seconds when competing on the track. The rear seat is also ditched in favor of a cross-car X-brace for added rigidity. Higher spring rates and a larger rear stabilizer bar help the tires grab hold around the tight corners and curves. Drivers can also use a screwdriver and dial in the shock’s level of stiffness by twisting adjustment screws on the top of each shock. The engineers also focused on the Laguna Seca’s aerodynamics. A front splitter adds downforce at the front of the car and directs air under and around the car. Also, a rear spoiler provides as much as 40kg of downforce at the rear of the car. The Boss 302 returned for 2013 with slightly different styling and accents reminiscent of the 1970 model. Standard LED lighting, a new grille and splitter, and functional hood extractors are new for 2013. Hockey stick striping starts just over the fender and extends down the body panel and features reflective tape that glows when hit by light. Recaro cloth seats with manual adjustment and Torsen helical differential round out available 2013 model year options for the Boss 302. The Boss 302 features Track Apps which allows the driver to monitor performance stats such as 0 to 60, quarter mile, and braking times. Track Apps also features a “Christmas Tree” countdown timer just like the one at the drag strip. In addition, there’s a Gauge Mode which monitors critical factors such as air/fuel ratio, boost/vacuum, cylinder head temperature, and inlet air temperature. It’s all located on the 4.2-inch LCD screen in the center of the instrument panel. The Laguna Seca also returned for 2013. It was available two color schemes: Black or School Bus Yellow. It featured Sterling Gray accents on the grille, mirror caps, and rear spoiler. Sterling Gray 19-inch machined aluminum wheels were also standard equipment. Likewise, Ford painted the interior’s rear cross-brace in Sterling Gray for 2013. Once again, Car and Driver put the Boss 302 to the test in September 2012. This time around, they had the Laguna Seca model and posted a 0 to 60 time of 4.2 seconds and ran the quarter mile in 12.7 seconds at 114 mph. These numbers were slightly up from 2012 and were achieved by getting rid of those pesky exhaust restrictor plates. And just like that, it was gone once again. Just like the original, Ford produced the Boss 302 for only two model years. Was it worth the 43 year wait for its return? We believe so. It’s rare that a car comes along twice with capabilities of the Boss 302. Who says lightning doesn’t strike twice?